Up to nine copies per church are available at no charge. 10 or more copies will be charged $.50US/$CDN each plus appropriate shipping/handling. Please call 800-333-8300 to order printed copies, or download this resource free on The Network. . 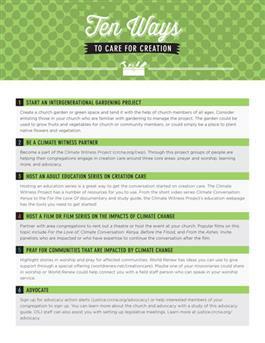 Here are ten ways that your church can get involved in caring for God's creation.